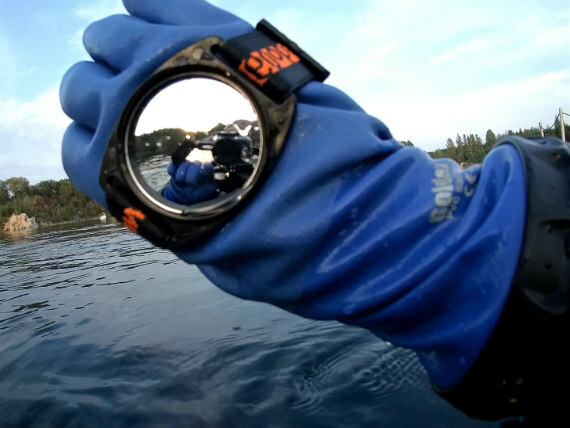 The 360 Observe is a small convex mirror worn around the wrist or hand, enabling divers to effortlessly maintain eye contact with other divers, their equipment and surroundings. The 360 Observe is a small circular convex mirror mounted in a plastic surround. The surround is attached to an elastic webbing strap which can be adjusted to fit on a gloved hand, around a wrist or clipped on to a BCD, if preferred. The mirror measures 50mm across. Underwater vision is always restricted – wearing a mask narrows a diver’s field of view; the water may have poor visibility; the environment could be lacking any ambient light, for example inside a wreck or cave system, or in deep water. The 360 Observe is an essential addition to any diver’s kitbag; this convex mirror is worn on the wrist or back of the hand, allowing the wearer to simply raise and angle it for quick all-round vision. Dive guides can easily see a group of divers without needing to turn round. Instructors can watch a student perform skills, and even make eye contact through the mirror to reassure them. 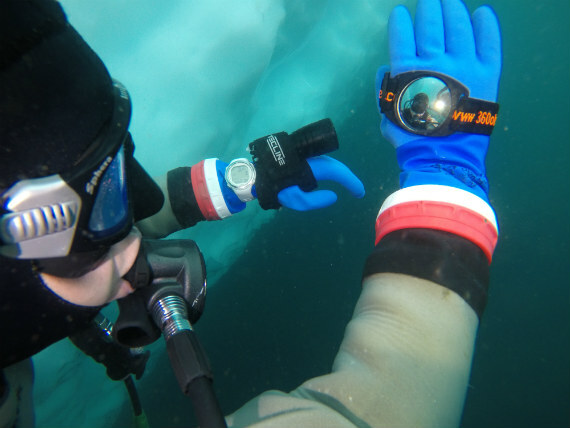 Technical divers can use the 360 Observe to do a bubble check on hard to see valves, or check a piece of equipment attached to the side or behind is where it should be and performing correctly. On ascent, the mirror can be positioned to look up without the diver needing to roll over. At the surface, the mirror is ideal for swimming backwards towards a buoy or a boat. In an emergency it can be used to signal a rescue vessel.